"During the progress of the 20 months from April 1917 to November 1918, Bath was utterly transformed." - Henry Wilson Owen,The Edward Clarence Plummer History of Bath, Maine, 1926. 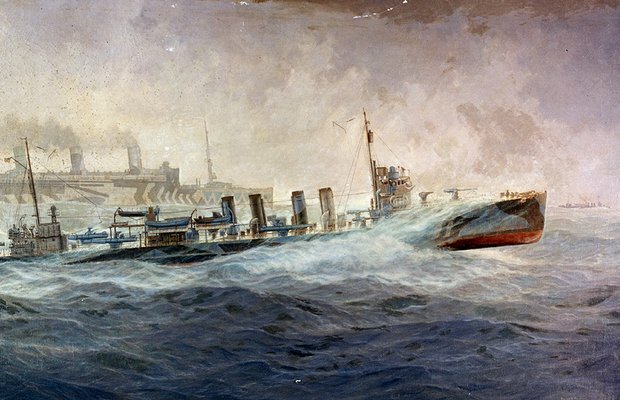 The significance of naval and merchant ships, and by extension the shipyards that built them, was more uncontested in the unprecedented searing magnitude of the first World War – when land armies had yet to become highly mechanized, and air power was a novelty – than it was in the grim repeat of WWII. Bath and other Maine coastal communities with long-standing shipbuilding reputations felt the war-fever flush of national attention (and cash) as America finally surged into action, declaring war against Germany on April 2, 1917 after three years of indecisive neutrality. The "Pull Together" exhibit will examine Maine’s contributions (and losses) of ships, resources, and personnel in the Great War, including Bath-built commercial sailing vessels sunk (or missed) by the German navy, coastal defenses and patrol craft, and the service careers of Maine-born mariners and Maine-built ships of all kinds, from yachts to four-stackers to submarines. Other related topics will include life in the "delirium" of wartime Bath as revealed in contemporary newspapers, propaganda, posters, photography, and other original collection sources at Maine Maritime Museum.